Nor’wester Therapy Dogs work solo with their handlers in classrooms under the supervision of a teacher. The schedule coordinator works hard to match suitable therapy dog teams to a specific educational environment. Volunteers are needed during the course of the school day. We strongly encourage volunteers to be able to commit to weekly visits for consistency and to offer the greatest educational impact and support. 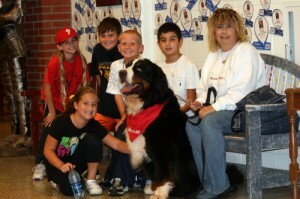 Therapy dogs become a vital part of the teacher’s instructional strategies. In addition to working in school classrooms, we also have opportunities for volunteers to become involved in our Comfort Dogs on Campus program at BCCC (Newtown campus) as well as in our public library programs at the Free Library of Northampton Township (Richboro, PA) and Southampton Free Library (Southampton, PA). If you would like to become involved as a volunteer with your therapy dog, click here.